For this year’s Spring Break boondoggle, Benita, the Urchins, and I headed out to Las Vegas for a few days before we ventured up to Zion National Park in Springdale, Utah. I once again realized that the Urchins are not in line to be the Dragon Warrior as they cannot survive on the dew of a gingko leaf and the energy of the universe, so our first task after checking in to the Cliffs at Peace Canyon was to head out for provisions. While at the local Walmart, Benita and the Urchins headed off for cereal and snacks while I headed in the direction of liquid refreshment. While NJ is a bit of the Wild West in terms of the postal service and what can be delivered to your front door, we are not enlightened enough to allow beer, wine, and liquor sales in the grocery store, so imagine my surprise when I saw ALL of that for sale in close proximity to the loaves of bread, containers of milk, and sticks of butter (thank you Sesame Street!). Talk about your one stop shopping! With an activity schedule that featured many hours of hiking through Zion National Park, I knew that at the end of each day I would be in need of some thirst quenching libations, so I just had to get a six pack or two. You know, for medicinal purposes only. I may not have been a Boy Scout, but I still wanted to be prepared! 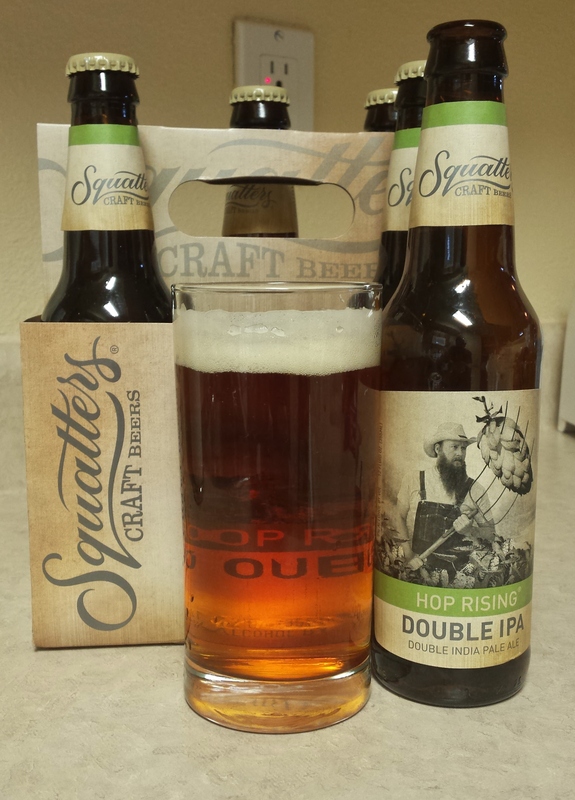 One of the purchases was the Hop Rising, a double IPA from Squatters Pub Brewery. Squatters is a brewer from Salt Lake City, Utah that was founded in 1989, shortly after legislation was passed in Utah that allowed brew pubs. Squatters operates three brew pubs (one in Park City, one in Salt Lake City, and one in Salt Lake International Airport) in addition to producing a lineup of 11 beers. Today, Squatters is a partner with Wasatch Brewery in the Utah Brewers Cooperative. A mighty hop-lover’s dream. Hop rising adds malty backbone to an intense Imperial IPA. This insanely smooth dry-hopped ale has everything: 9% ALC/VOL, 72 IBUs, and yes, that’s our master brewer Jason Stock pitching in on the label. Appearance: Nice color with lots of foam. Aroma: Smells fantastic. Hits all the right 2x IPA notes. Hoppy? Check. Minimal doughy aromas? Check. Strong citrus note (mostly grapefruit)? Check! Taste: Tasty with a nice blend flavors. Good upfront hops & citrus with a good bit of bitterness and some puckering in the finish. The taste belies the booze & the bottle goes down a bit too easy. Overall, not the greatest double (I’m partial to Lawson’s Sip of Sunshine, Maine Beer’s Dinner and Southern Tier’s 2XIPA) but a strong representation. I was pleasantly surprised to find this one on the Walmart shelf and it was a welcome relief to the busy and lengthy treks around Las Vegas. I know I’m not going hungry. Not too sure about the rest of you.